Feedback results in 2.6x more learning progress than reducing class sizes at 1/4 the cost. "Using Kaizena enhanced teachers’ relationships with students." In her doctoral dissertation, "The Impact of Audio Feedback Technology on Writing Instruction,” Dr. Bless case-studies teachers in the U.S and around the world who use Kaizena and explores how Kaizena impacted their classrooms. Dr. Bless found that Kaizena audio feedback "was more personalized and efficient than written feedback” and that “using Kaizena enhanced teachers’ relationships with students.” By speaking their feedback, teachers felt more personally connected to their students, and the time saved from grading papers and writing feedback afforded more time and energy for teachers to interact with students in person. 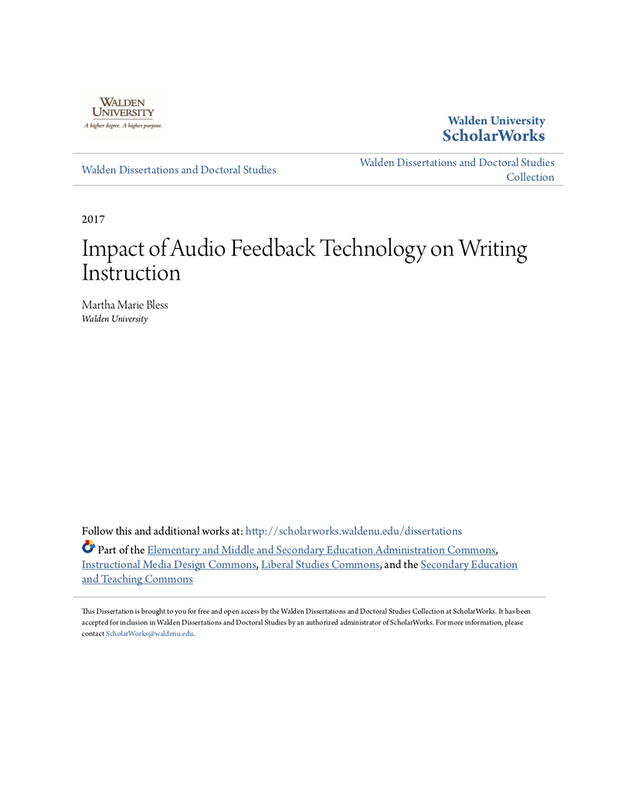 Teachers also reported that students preferred and understood audio feedback better than written feedback. By hearing the tone of their teacher’s voice, students were more likely to feel supported in their writing. Hearing comments, instead of reading them, left students more receptive to the feedback and increased their desire to improve. "Students’ capacity to see and track their progress in writing via Kaizena empowered them to face new and continual challenges when writing." 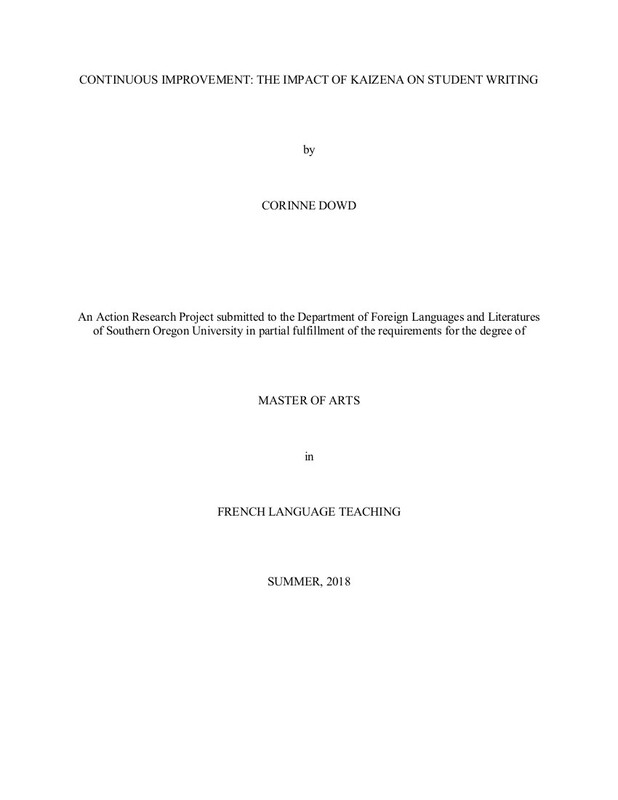 Dowd's research examines the use of Kaizena in a high school French language classroom. She evaluated students' writing abilities, their confidence, and their perception of their own skills over the course of four written assignments. She found that while their writing did improve, the greatest improvement was in their confidence and perception of their own abilities. Giving personalized feedback through Kaizena allowed her to encourage students to take ownership of their work and their learning; for example, students would highlight sections of their work they were proud of. Students confidence grew when they were able to have an asynchronous, personal discussion with their teacher on each assignment: they were able to discuss feedback they were unsure of or confused by, allowing them to fully understand how to improve. Dowd also noted that Kaizena allowed her to develop a more personal relationship with each student. The comments that students made in Kaizena allowed her to get a sense of each of their personalities, which not only improved her connection with her students, but also allowed her to further tailor her feedback to fit each student. "Results showed the majority (66.7%) of students surveyed preferred the addition of voice comment feedback over written comments alone." Lunta, T. & Currana, J. "This paper examines the benefits of using audio, as opposed to written, feedback in an attempt to overcome student criticisms. The results were, generally, very positive." Rethinking the Red Ink: Audio-Feedback in the ESL Writing Classroom. "This paper describes audio-feedback as a teaching method for English-as-a-Second-Language (ESL) writing classes. Using this method, writing instructors respond to students' compositions by recording their comments onto an audiocassette." "This article is concerned with a method of giving feedback which attempts to address the problem of giving more feedback in less time." Oomen-Early, J., Bold, M., Wiginton, K. L., Gallien, T. L., & Anderson, N.
"The researchers conclude that the field has adequate evidence and rationale to support the use of AAC broadly and routinely in online classrooms." Olesova, L., Richardson J., Weasenforth D. & Meloni C.
"Students perceive audio feedback as personal and enjoyable, and it helps increase their interest and feel the instructor’s care." Merry, S. & Orsmond, P.
"The students responded very positively to the audio file feedback judging it to be good quality because it was easier to understand, had more depth and was more personal." Ice, P., Reagan, C., Phillips P. & Wells, J. "Our investigations revealed an overwhelming student preference for asynchronous audio feedback as compared to traditional text based feedback, with no negative perceptions of the technique." Does it make a difference? Replacing text with audio feedback. King, D., McGugan S. & Bunyan, N.
"We do believe that audio feedback can be used successfully to meet student feedback expectations. These expectations can be met through feedback which has the potential to be more personal, more in-depth and we would argue more engaging." "The available research evidence suggests that formative assessment produces greater increases in students' achievement than class-size reduction or increases in teachers' content knowledge, and at a fraction of the cost."" "This evidence shows that although feedback is among the major influences, the type of feedback and the way it is given can be differentially effective"
"According to researchers in the area, formative feedback should be multidimensional, nonevaluative, supportive, timely, specific, credible, infrequent, and genuine"
I see and I remeber. I do and I understand. Review up to 75% faster than typing with Voice Comments. Embed explainer videos in three clicks. Track Skills and we'll auto-complete your rubric. Welcome to the future of feedback.